H.F.S Balls! India is crazy. It makes the rest of the world look like Disneyland. 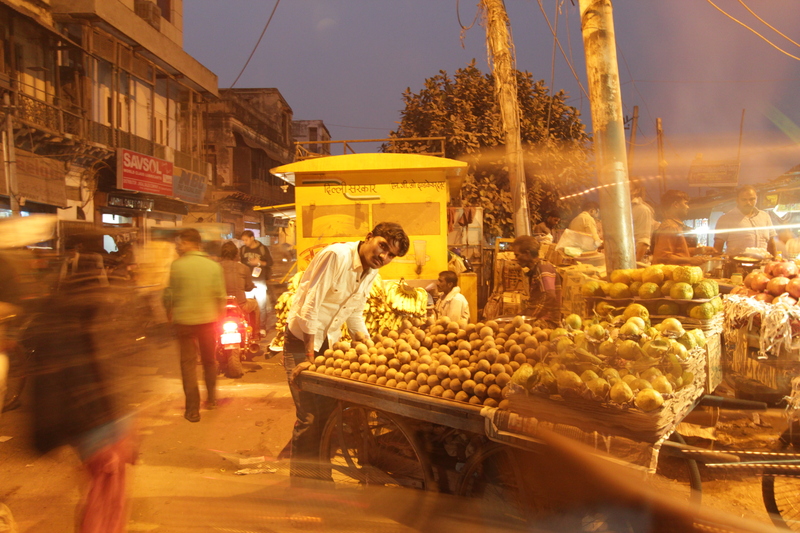 We arrived in Delhi today, and after a rest headed out into the old city in a hotel car. Not to seem meek, but ‘wow’ was I glad to be in the car safely wrapped in a metal and glass enclosure. The window opened only for a second, and the smells and HONKING came pouring in. People are everywhere doing everything. Little girls spitting and throwing up out the side of the school bus, men casually leaning against their rickshaw delivery carts while combing their hair, numerous people peeing. There are no private places. It’s quite frankly the most shocking place I have ever been. I’ve read Rohinton Mistry and seen Slum Dog Millionaire like anyone else, but nothing prepared me for this. I’m sure I sound and am naive, but it’s scary…especially travelling with three young children. Even in the car we are gaucked at. 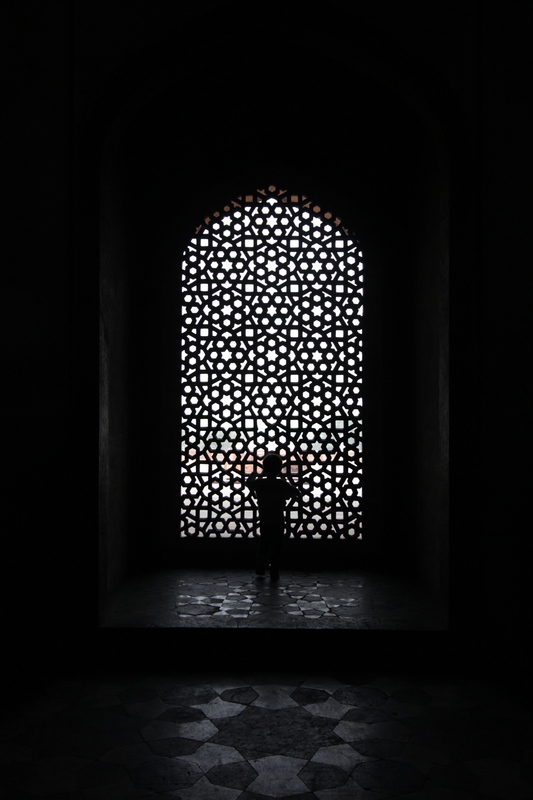 We ended up at a mosque today, which thankfully was somewhat tranquil, and even there, we were asked for our photo at least 15 times, mostly by giggling school girls and family’s, but also by single men (let one click and there are five more). Because it was a mosque, I was given a giant blue jalava, when we entered. Immediately it gave me a sense of relief and a kind of protection that I have never known before. It’s given me a different perspective on what it is to be a woman here and elsewhere. At home, in Canada, I never need to hide, but here as a woman it’s important to look away or you invite leering unwanted attention. The mosque was beautiful in the setting sun. I have never been in a mosque before, so it was a real treat. The kids were exhausted from our early flight from Bangkok and fell asleep in the car on the ride home. We didn’t bother to go to a restaurant and ordered room service. The food was amazing. Fresh and rich and delicious. It was better then any Indian food I’ve ever had. A new day. Today feels better. We are fresh from a good night sleep. While don got a sim card, a beggar woman approached our car. How do you explain to children about beggars, when we have always tried to encourage empathy and generosity? 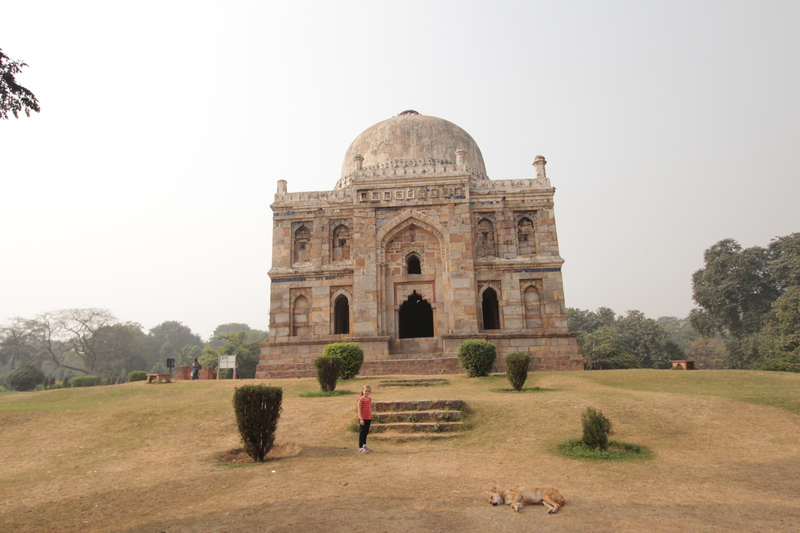 Prakesh, our driver, took us to the Lodi gardens today. 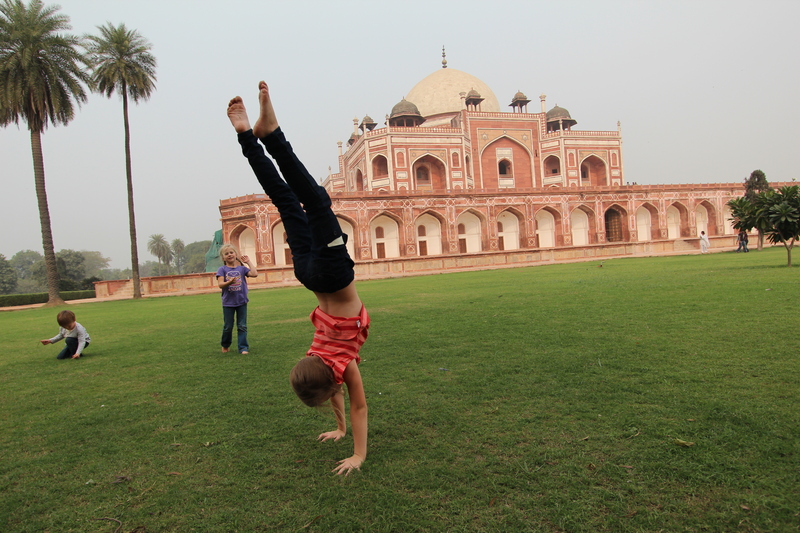 What a relief the gardens are a world away from the mayhem of Old Delhi. Perhaps in retrospect going to Old Delhi first thing was not really a great idea. 0-100 in the first hour. At least everything will now seem bland, I think. We had a good time checking out the old buildings and mosoleums. 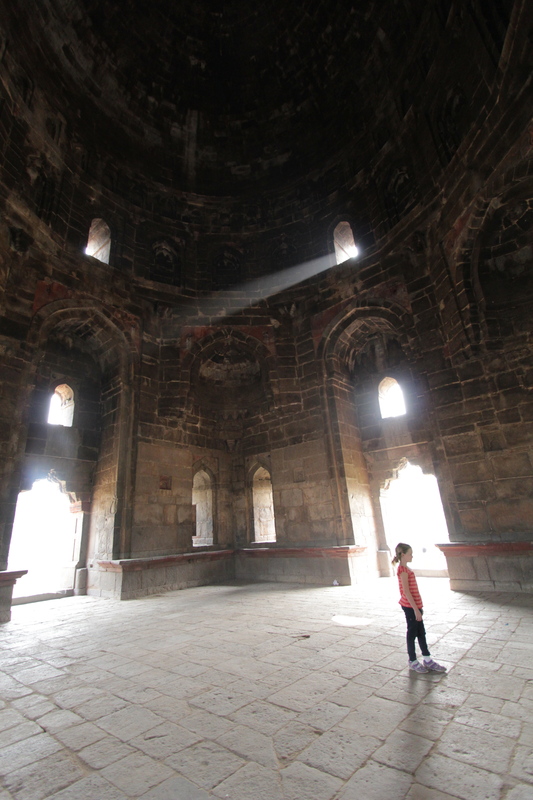 Most of the famous buildings and ruins are muslim, built by Mughal. The colour of the sun is so beautiful. All day the city is caste in a glowing pink from the pollution. We spent the day shopping. While most of the streets are CRAZY with traffic, honking, carts filled with everything you can imagine, there are a few shopping areas that are what you might call ‘normal’ or at least ‘normal-er’. 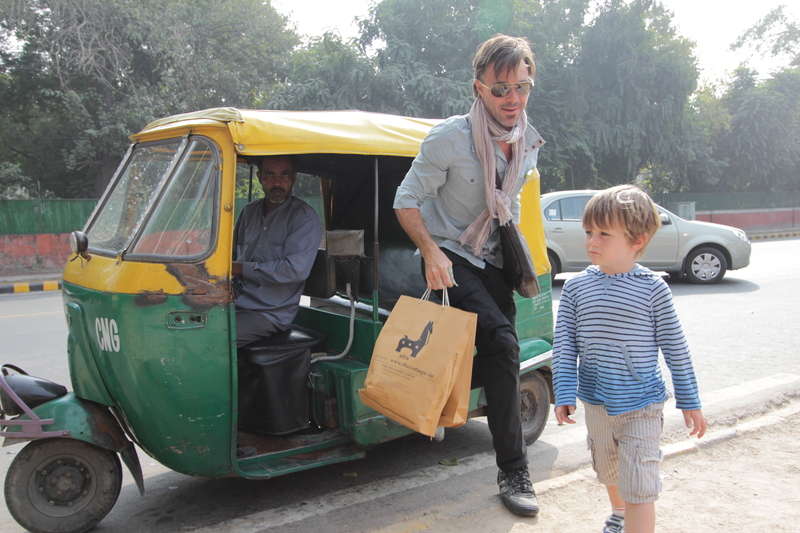 We went to the Khan Market which is were all the expats and diplomats shop. The market is a series of tiny streets lined with shops in three floors. We had some pizza, bought new sunglass to replace my 2nd broken pair, sandals, a scarf for the one I lost, giant heavy photo books, and a new box of lego. The kids were beside themselves thinking about the prospect of new lego. In their “play time”, they either draw or play lego. This is the most western I have felt in ages. We took a tuk tuk home through the traffic. The driver had to turn around several times, because of a political protest. 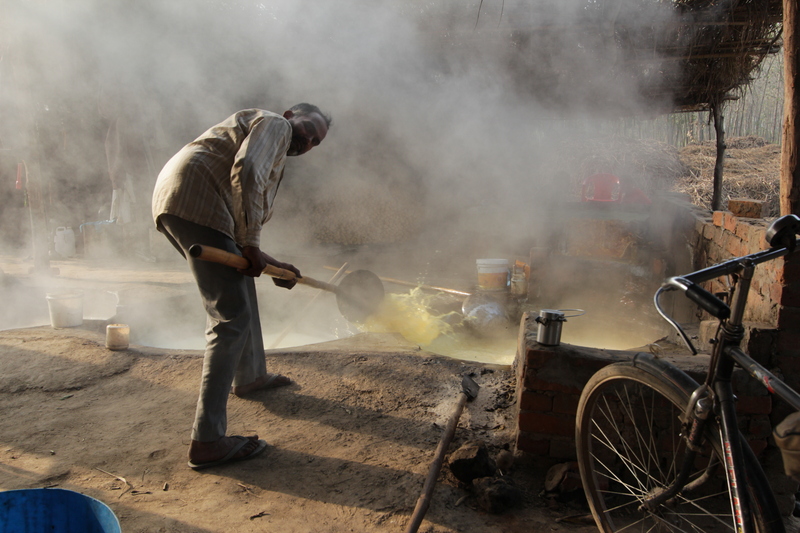 Banging of pots and loudspeaker political messages being amplified in Hindi. 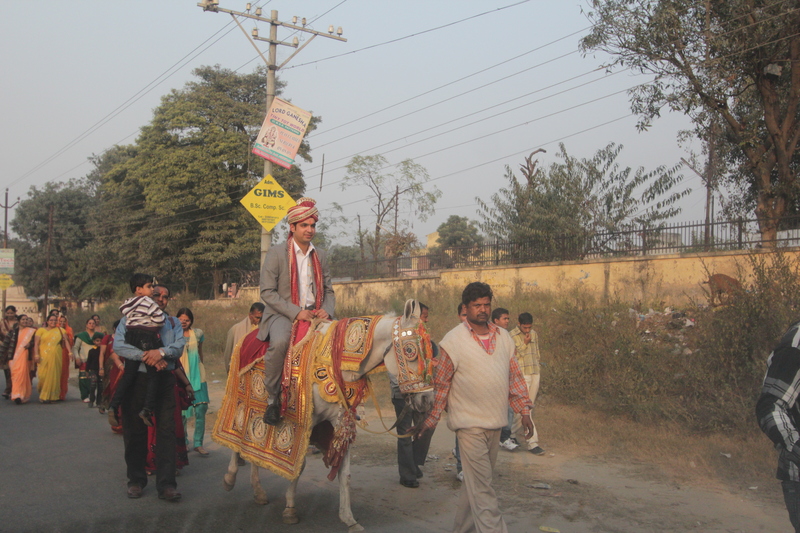 It is traditional in India, for a groom to arrive by horse. On our drive we saw at least 20 weddings, one in a car accident. 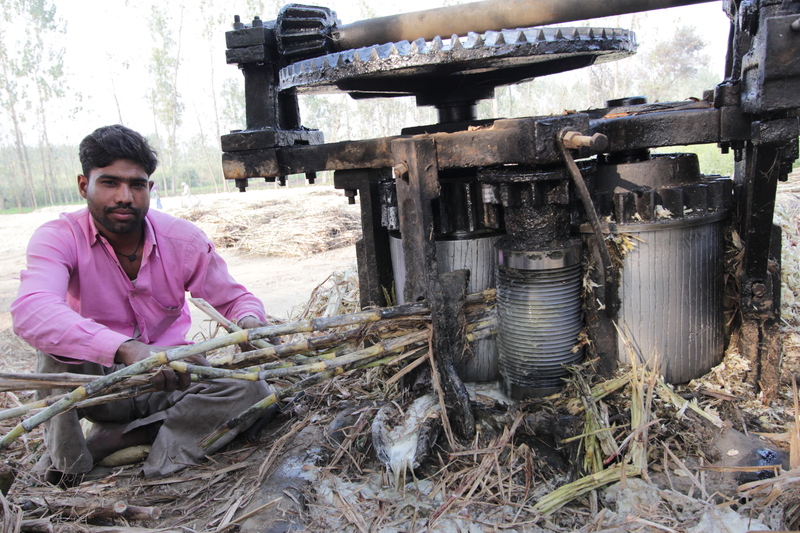 These guys are making dried sugar balls from sugar cane. The driver pulled over for us to check it out. Can’t imagine what the men thought…Where did the american family come from and why are they taking pictures? After 8hours of driving we arrived. The kids didn’t complain at all, and played with their pencil crayons like they were dolls. Toys, who needs them? 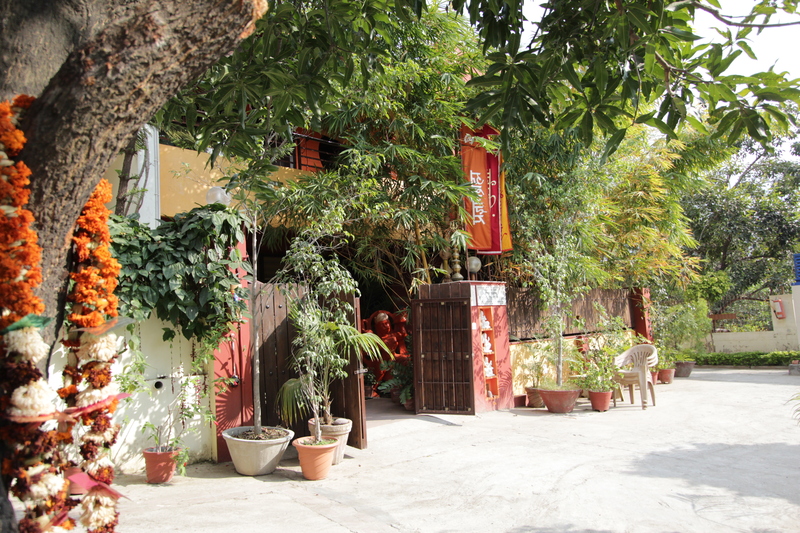 We are staying in an ashram, which sounds kinda swami-ish but is really just an apartment owned by the ashram and kept for followers, monks or the odd tourist family from vancouver. Sparse, but clean and safe. It has three monk-orange bedrooms and a big kitchen, and best of all it’s away from all the honking! 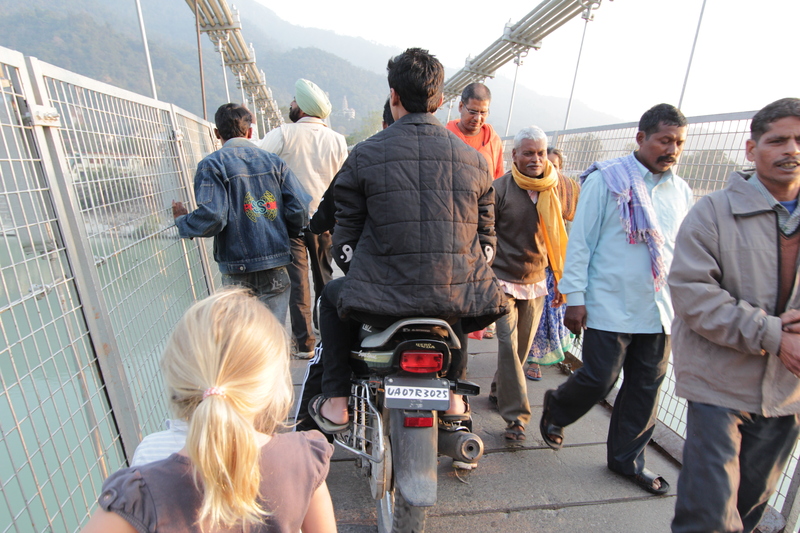 We played on the banks of the Ganges today. Wow, that’s kinda fun to write! The river is clean up here in the mountains. A bit like going for a dip in the Lillooete River in Pemberton, very silty and cold. Washed away all our sins. 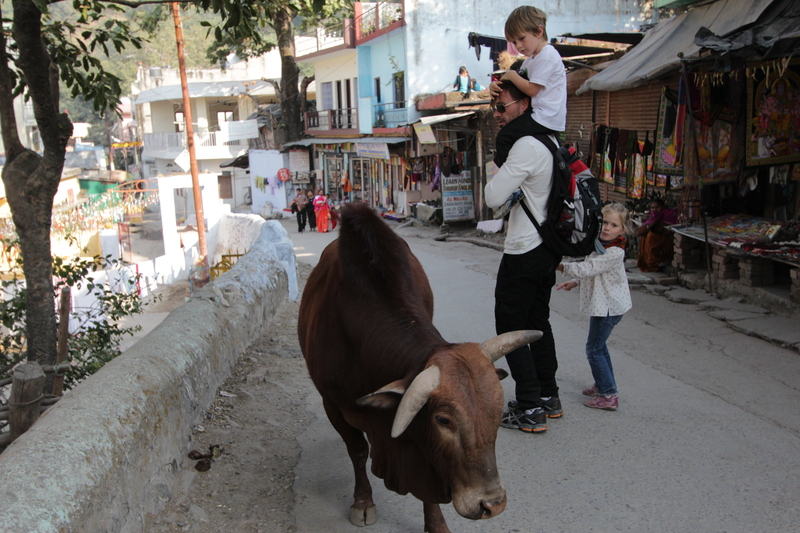 The city is filled with an assortment of holymen, monkeys, monks, tourists, and hundreds of cows. It’s not dog-doo you need to look out for, its cow-doo. 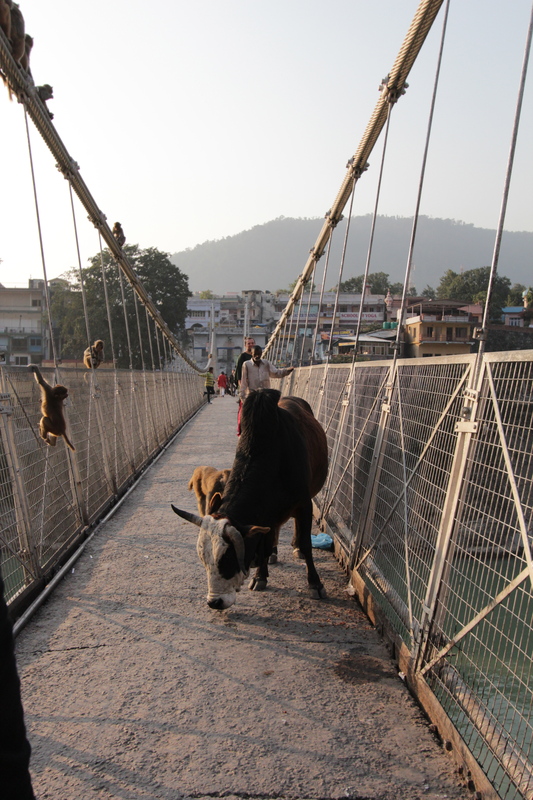 We got stuck on the suspension bridge between a family of scary monkeys and a bull swinging his head. That’s never happened before. 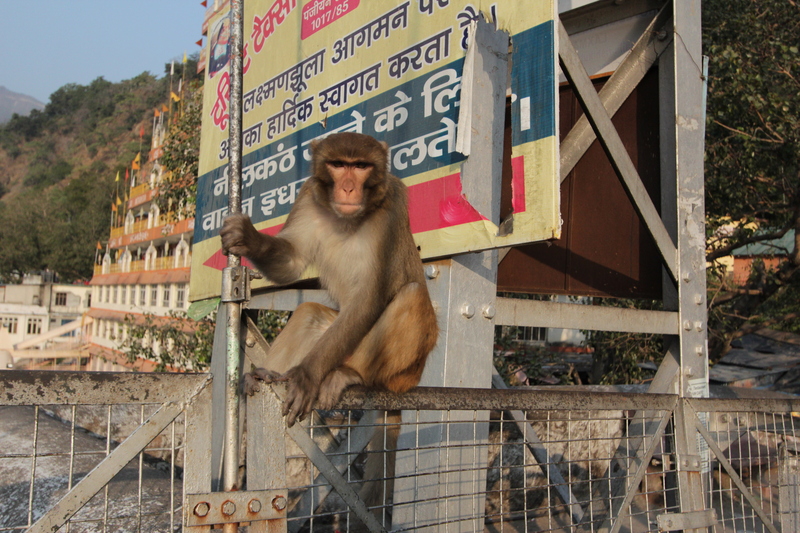 The monkeys are twice the size of the monkeys in Thailand and they will chase you if you look them in the eyes. This one made a run for me. We met the guru of the ashram today. He welcomed us into his sitting room for talk. The room was full of overstuffed couches (one of which is reserved only for the guru himself). Of course Gwen sat in it, but it was before anyone noticed. We had tea and talked while the sun set. A very jolly and peaceful man. He’s from Spain and seems like a normal guy sitting on a cushion, except for orange robes, giant beard, and Buddha-like pose. Ash was so tired from walking, he fell asleep and the girls just sat and listened (not normal). He talked to us about meditation and I think don is going to get up early and attend 5:30 session and I’ll do yoga at 8:30. There is no alcohol or meat allowed in this holy city (or at least none on the menus) and so we have decided to cleanse. 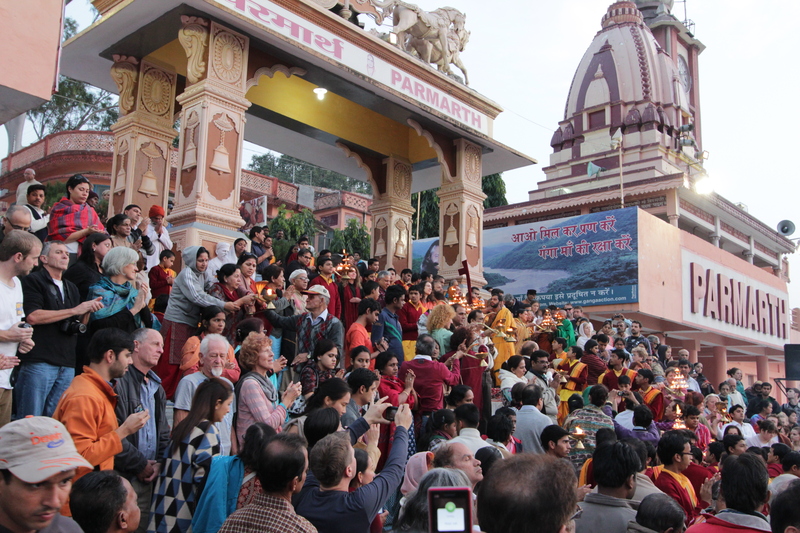 Gwen is in front of one of the hundreds of Ashram yoga centres. Some seem quite orthodox (like ours) and others are definitely a bit ‘laisse faire’…We dropped the i-pad, which smashed the glass, so we’ve had to start reading the only paper children’s book we have, which are children’s stories about buddha. I guess we’re going all out with the spiritual stuff. Today’s lesson was about treating people kindly, so it works. A dip in the Ganges. 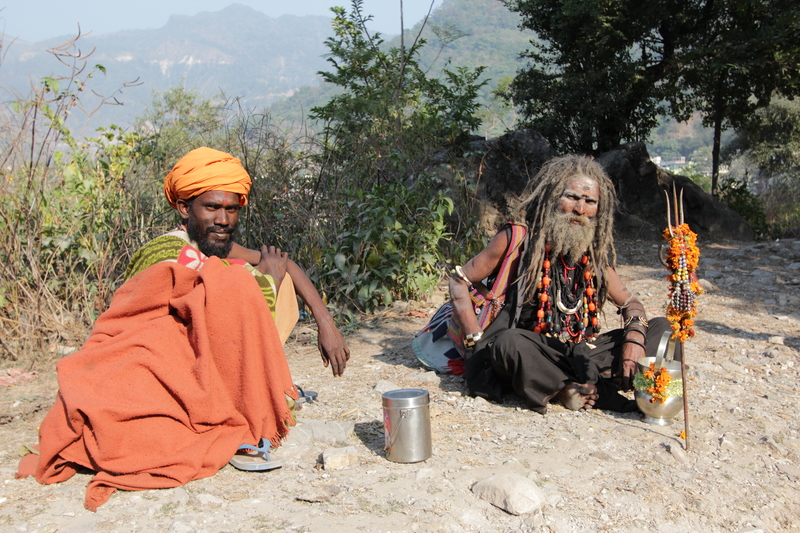 These guys are sadhus. Supposedly they have reached the fourth phase in a Hindu’s life, after studies, being a father and a pilgrim, and following a pilgrim. 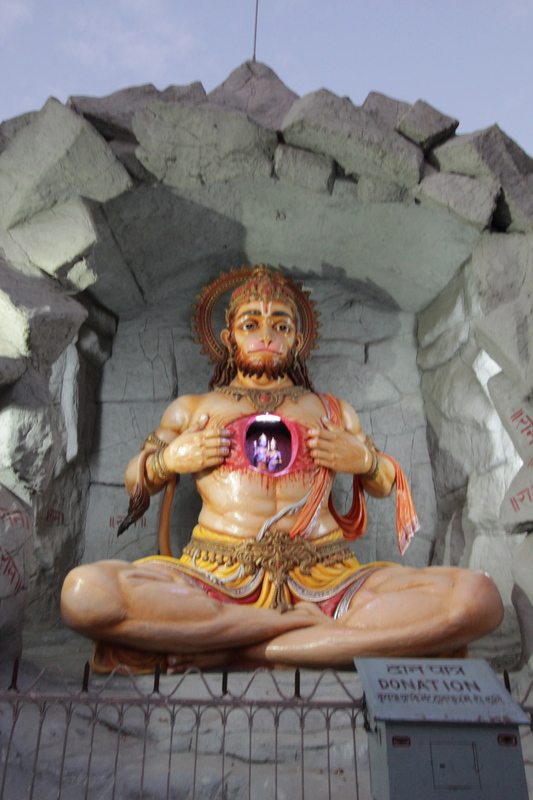 For a person to become sadhu he needs viragya. Viragya means desire to achieve something by leaving (cutting the attachments with family and society) the world (earthly attachments). Don got up at 5:00 and meditated with the guru this morning. We were already awake: bells and gongs echo through the valley from 4:00. He came back full of love and hugs. The meditation room is on the second floor of the ashram, has wood floors and is filled with various large yellow or orange pillow seats for the Guru (apparently he likes to sit in many different seats). Don sat still in the meditative position for over an hour. He said it was hard, but overall a great experience. I went to yoga at 8am. I recognized only two poses (pigeon and a back bend pose), the rest was more about body movements and breathing (vyayam and Yogasanas). Kids did school, and then we spent the rest of the day walking around the city. There are some freaky people here, some genuine seekers, and others who just make money being a sideshow. It certainly gives good concrete material for discussion about ethics, beliefs, and life. We made our way to a nearby town with one of the biggest Stupa’s in the world. We are getting down with Buddha! 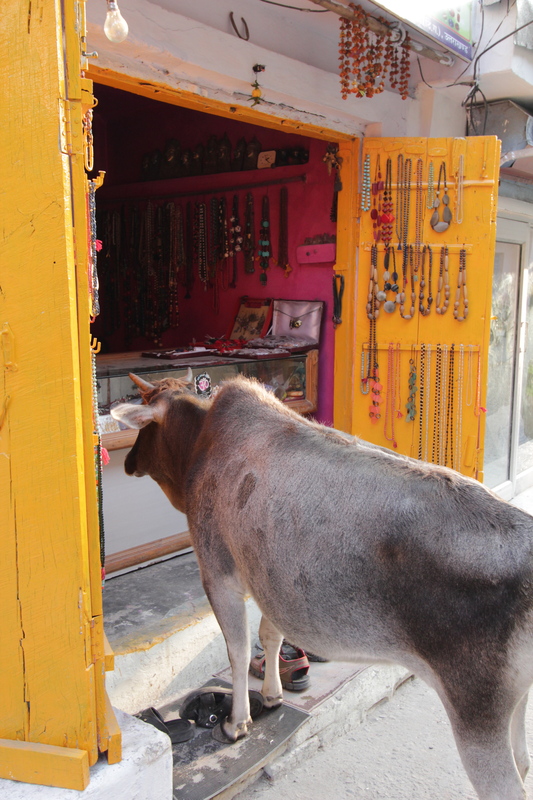 After a week, I suppose I have gotten used to the sights and sounds of India. It’s not as shocking and not as scary. 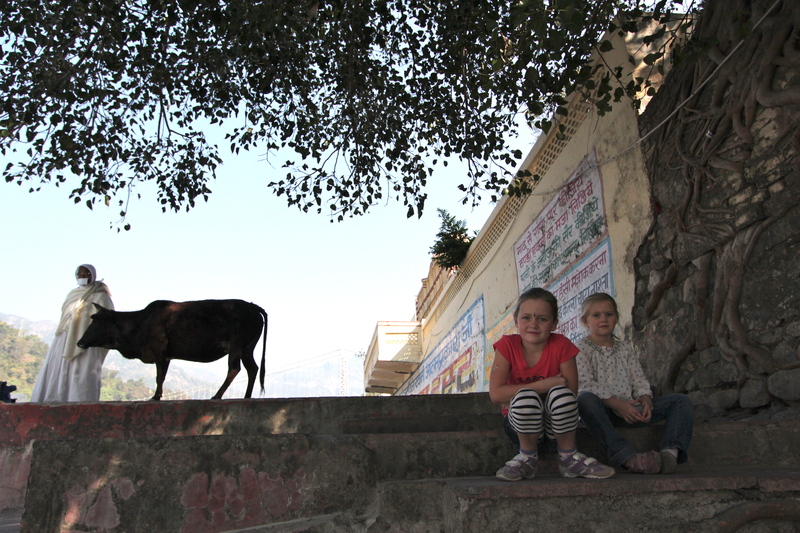 When asking the kids what their favourite thing about India is, they have said, “cow’s everywhere”. We have met some wonderful people, who are generous and clearly adore our children. The kids are used to people asking for their photo. A school group of adolescent girls was at the Stupa today, Close to 30 kids came up to Gwen to shake her hand and give her cheek a well meaning squeeze. After the 10th photo, I had to stop them, with a “no more photos please”. Unbeknownst to us we are celebrities here for some reason and it’s almost impossible to go anywhere without people stoping us and asking for photos (security guards with big machine guns included). Ashton gets the worst of it. They pick him up, kiss him and pass him around. Normally the kids are good sports about it; I wouldn’t be surprised if you find us under google images for ‘Canadian family’. I asked if they would miss their celebrity status when we go to Europe, and all of them said NO. 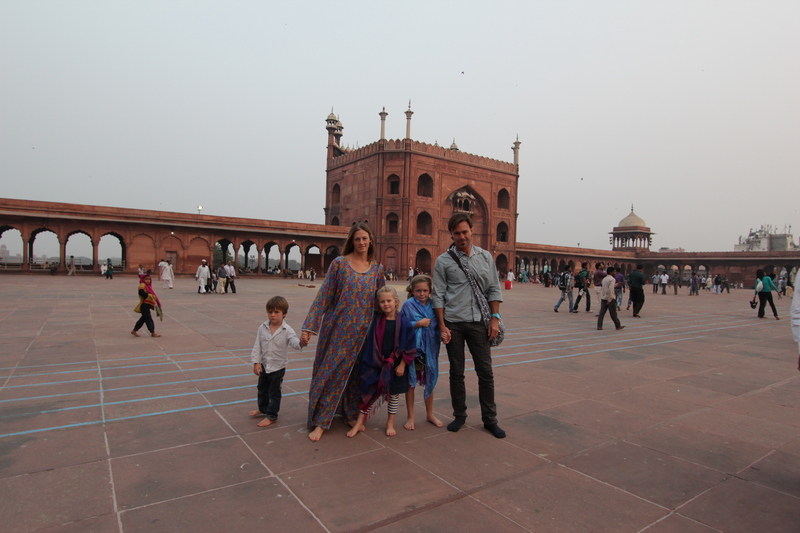 We are planning on heading to Agra (Taj Mahal) in the next few days and then Jaipur. 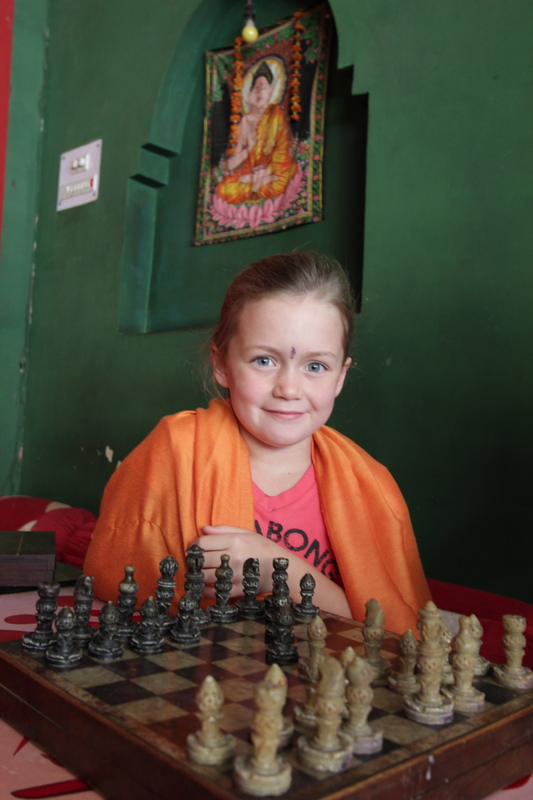 I think the initial shock of India has worn off a bit, and I’m hoping to relax a bit more, while still griping my children.